Boston, MA - (February 7, 2019) - Major League Lacrosse (MLL) released today details around top draft prospect and Loyola University’s standout attackman, Pat Spencer. Loyola University Maryland is a private Jesuit liberal arts university in Baltimore, Maryland. The Loyola Greyhounds men's lacrosse team was founded in 1938. The Greyhounds have appeared in the NCAA tournament 25 times, have made the Final Four 5 times, and won a national championship in 2012. Their current coach is Greyhound alumnus, Charley Toomey. The Greyhounds have produced many MLL greats and MLL current players. Across Major League Lacrosse’s nine teams, there are currently sixteen Greyhounds on preseason active rosters. The current players include: P.T. Ricci (Florida Launch), Jack Carrigan (New York Lizards), Mike Orefice (Boston Cannons), David Manning (Charlotte Hounds), Ryan Fournier (Dallas Rattlers), Brian Begley (Denver Outlaws) and Brian Sherlock (Atlanta Blaze). Loyola is also where MLL coaching legend, Dave Cottle (Chesapeake Bayhawks), became a head college coach for the first time in his highly decorated coaching career. Pat Spencer is likely to join the ranks of these Greyhound standouts. In his college career thus far, Spencer’s accolades are extensive. Last year he was named the recipient of the Lt. Col. J.I. (Jack) Turnbull Award winner from the USILA as the nation’s top attacker. He became the first player in the Patriot League conference history to earn conference Offensive Player of the Year honors in each of his first three seasons. He has been named to the All-Patriot League First Team all three years of his career. As a junior he was a Tewaaraton Award finalist for the second year in a row. In 2018 he set the Loyola single-season record for both points (94) and assists (59). 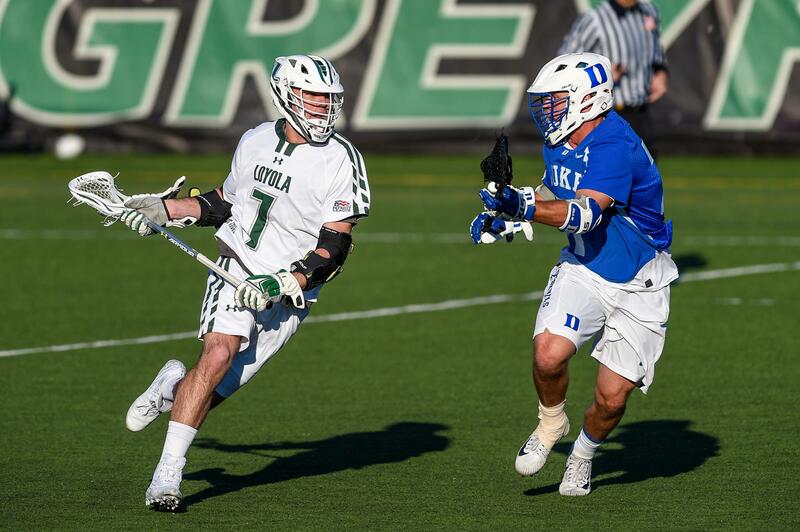 While Spencer’s skill and athleticism make him a likely first-round draft pick, there are rumors Spencer may delay his professional career in Major League Lacrosse to pursue his love of basketball. Edward Lee, from the Baltimore Sun, reported, Spencer’s summers are spent playing basketball in the Annapolis Summer Basketball League and his time playing lacrosse at Loyola may be leading him to, "reach his ultimate objective: playing basketball for an NCAA Division I program in 2019-20". Spencer is on pace to graduate this spring with a bachelor’s degree in finance and earned a 3.5 GPA his junior year. After graduation, if he chooses to, he will have one year of eligibility to be used for basketball. So, what does this mean for the Major League Lacrosse coaches and GMs interested in infusing their team with Spencer’s level of skill and drive? If Spencer is drafted and forgoes the 2019 MLL season, the team that drafts him must add him to their protected roster at the end of the season, in order to retain his rights for the following year. Each team may have twenty-three players on their protected roster, unless an expansion occurs. If Spencer is not protected, he will be entered into the 2,500+ person player-pool. Despite the speculation of Spencer’s potential basketball career, Spencer has been identified as a top draft prospect by: Spencer Ford (Atlanta Blaze, GM), Tom Mariano (Florida Launch, Head Coach & GM), Sean Quirk (Boston Cannons, Head Coach & Director of Player Personnel) and Bear Davis (Ohio Machine, Head Coach & GM). Coach Davis will make the first selection in the 2019 MLL Draft presented by Cascade. Tune into Lax Sports Network on March 9 th at 7pm to see if Coach Davis makes Pat Spencer the first overall draft pick of the 2019 MLL Draft presented by Cascade.